Welcome to Day 3 of the 2017 Pumpkin Week! Hosted by Terri from Love and Confections, 31 Bloggers will be sharing 106 pumpkin-filled recipes over the course of the week. Be sure to come back every day to see all the delicious creations - from muffins to cakes, cocktails, breakfast baked goods, savory pastas and stews, and gluten-free recipes too. You can also find these great recipes and more on Love and Confections' #PumpkinWeek Pinterest Board! Y'all this risotto (ok, mine is "faux-sotto") is absolutely delicious and I have so many ideas about ways to serve this dish. I really think the addition of fresh mushrooms would go well for additional flavor depth and texture. This would go great with just about any protein. I used a long grain rice mixture (because that's what I had) but left the recipe with arborio written in. One of these days I'll use all of the right key ingredients! Heat the butter over medium to med-high heat in a non stick pot. Add in the diced onion and the garlic, and saute for about 5 minutes, until onion is starting to become tender and garlic is fragrant. Add in the rice, stirring frequently, and cook another 1-2 minutes. Add in the white wine, and stir occasionally until wine is mostly absorbed. About 3/4 cup at a time, add in the warmed stock. Allow each addition to mostly incorporate on a low simmer before adding the next batch. Continue adding stock and allowing it to absorb until rice reaches an al-dente texture, cooked through but slightly firm still (not mushy). Reduce heat to low, and add in the Parmesan. Allow to melt. Add in the pumpkin and stir to combine. Add in the sage, salt, and pepper. Stir until evenly distributed. Taste and adjust seasonings as necessary. Pumpkin Spice Coffee Syrup from The Nifty Foodie. Blackened Steak Tacos with Roasted Pumpkin, Sweet Corn and Red Bean Salsa from Bacon Fatte. Chicken and Pumpkin Curry from A Kitchen Hoor's Adventures. Pumpkin Beef Stew from Rants From My Crazy Kitchen. Pumpkin Beer Bread Pudding from Forking Up. 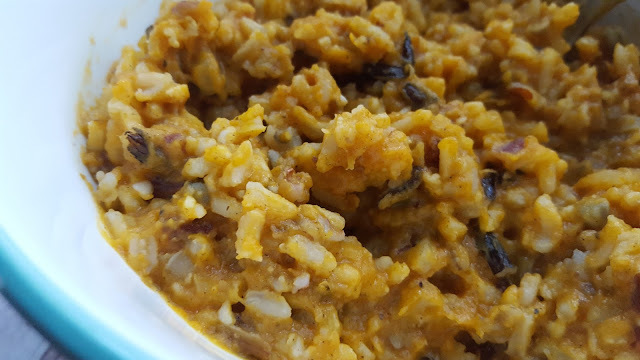 Pumpkin-Poblano Salsa from Culinary Adventures with Camilla. 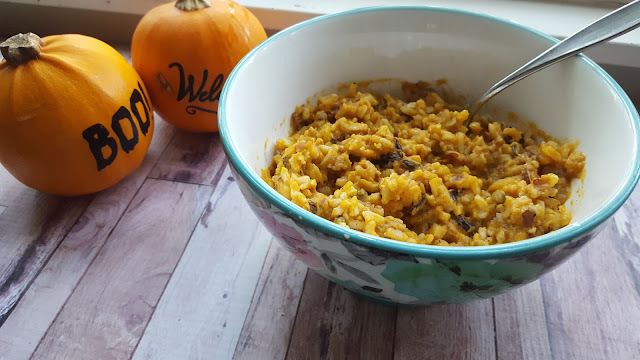 Pumpkin Risotto with Garlic and Sage from Making Miracles. Pumpkin Sausage Mac and Cheese from Daily Dish Recipes. 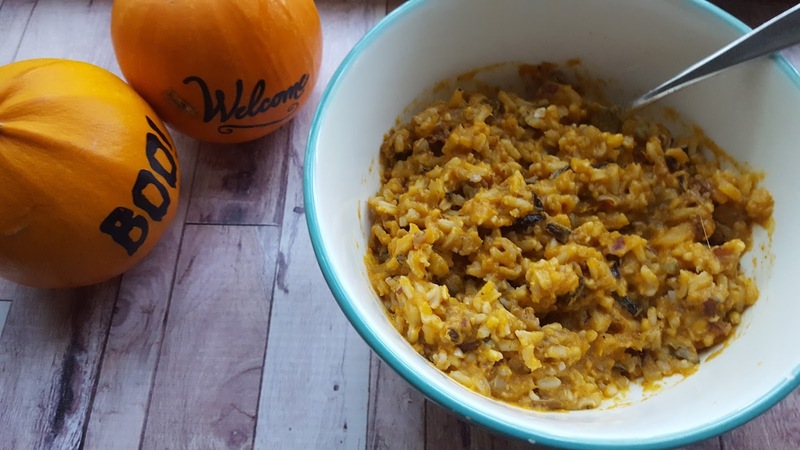 Pumpkin Sausage Skillet Dinner from Cindy's Recipes and Writings. Pumpkin Walnut Sage Pierogi from The Crumby Kitchen. Savory Pumpkin Sage Biscuits from Kudos Kitchen by Renee. Maple Pumpkin Monkey Bread from The Bitter Side of Sweet. Pumpkin Chess Pie from The Spiffy Cookie. Pumpkin Chocolate Chip Cookies from Amy's Cooking Adventures. Pumpkin Cranberry Muffins with a Pecan Oat Crumble from Hezzi-D's Books and Cooks. Pumpkin Dump Cake from Seduction in the Kitchen. Pumpkin-Nut Crumble Cake from Hardly A Goddess. Pumpkin Pie Cream Puffs from Mildly Meandering. Pumpkin Praline Cheesecake from A Day in the Life on the Farm. Spice Cookies with Pumpkin Dip from An Affair from the Heart. Stuffed Pumpkin Cupcakes from The Freshman Cook. White Chocolate Pumpkin Biscotti from The Redhead Baker. Love sage with pumpkin. Speaking of pumpkins I love your little guys in the photo. Thank you! Lindsey picked them out at the grocery store - I think they're super cute! :) And yes, sage and pumpkin seem to be a match made in heaven.